The Australian Government refuses to declare the destruction of Malaysia Airlines Flight MH17 a terrorist act, and is withholding state payments of $75,000 to each of the families of the 38 Australian nationals or residents killed when the plane was shot down in eastern Ukraine on July 17, 2014. 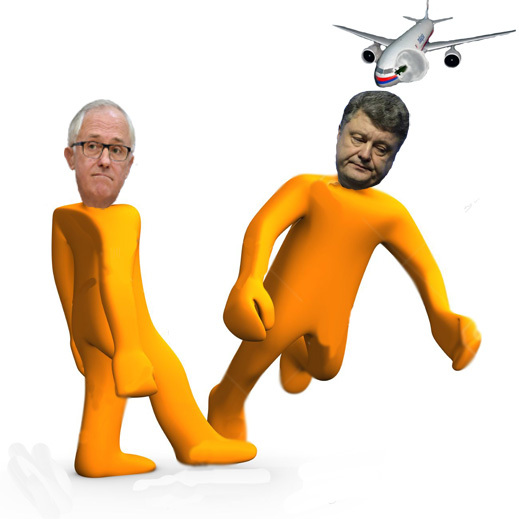 The Australian Attorney-General, George Brandis, has written to advise Prime Minister Malcolm Turnbull (lead image, left; right image, Ukraine President Petro Poroshenko) there is insufficient evidence of what and who caused the MH17 crash to meet the Australian statutory test of a terrorist act. 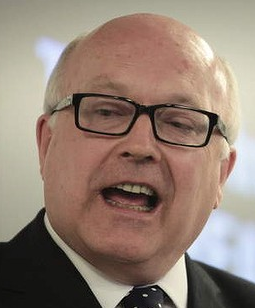 Because the Attorney-General’s legal opinion flatly contradicts Turnbull’s public opinions, Brandis’s advice is top-secret; he refuses to answer questions about the analysis of the MH17 incident which he and his subordinates, along with Australian intelligence agencies and the Australian Federal Police, have been conducting for more than two years. Brandis (right) was asked to explain the reason for the legal opinion Canberra sources confirm he has sent to the prime ministry denying the MH17 incident was terrorism. That he has provided the advice on AVTOP is confirmed by a source in Turnbull’s office. AVTOP is the Canberra acronym for Australian Victims of Terrorism Overseas Payment. This is how the AVTOP scheme operates, and how eligibility is decided, according to the Australian social security ministry. It records that the last terrorism incident for which Australians qualify for AVTOP compensation was the Westgate shopping mall killings in Nairobi on September 21, 2013. There were 67 fatal casualties in that incident, and more than double that number of wounded. One Australian was killed. On October 6, 2013, two weeks after the incident, the Australian prime minister issued a formal designation of the terrorist incident for AVTOP compensation. That commenced on October 21, one month after the incident, according to the statutory filing in the Australian parliament. The prime minister then was Tony Abbott; his attorney-general was Eric Abetz. In March 2016 Turnbull had replaced Abbott as prime minister; the attorney-general was Brandis. They agreed to designate three bombing attacks in Brussels, at the airport and at a city train station, as terrorist incidents for AVTOP. The date of the incidents was March 22 (pictured below). The date of the Turnbull-Landis designation was May 6 – 45 days later. There are press reports that Australians were in Brussels, and were anxious; there are no reports of Australians being killed or wounded in the attacks. Why were successive Australian officials so quick to designate the Nairobi and Brussels incidents as terrorism, before the local police and courts had time to investigate and prosecute, and why have the Australian officials spent two years and eight months refusing to designate the Ukrainian incident? Canberra sources believe the answer is that there is no legal basis in the Australian Criminal Code for doing so because the evidence of terrorism in the MH17 case isn’t there. For background on the debate among government officials, police and lawyers about the impact of Australian law on the MH17 incident, read this. Canberra sources explain that even if Brandis had told Turnbull there was enough evidence to certify the MH17 shoot-down as a terrorist incident, according to the criminal code provisions, the prime minister still has a broad discretion in deciding whether or not to make a declaration regarding a particular incident. That Turnbull hasn’t done so for the MH17 carnage means he doesn’t want to do so — and not only because of his attorney-general’s advice. Turnbull was also behind press leaks that as a cabinet minister under Prime Minister Abbott in August 2014, he opposed a scheme of Abbott’s to send 3,000 Australian troops to join Dutch and other NATO forces in a US-backed military operation in eastern Ukraine. Abbott and NATO had prepared the justification for the military operation as Russian state terrorism in downing the MH17. Turnbull arranged for his son-in-law to reveal the cabinet papers and intelligence reports from the time, and to record his assessment that Abbott was foolhardy. For that story, click here. Australian sources who know Turnbull don’t agree in their interpretation of what he is now saying and doing. Some sources believe that with his political mouth Turnbull is backing the US position against Russia and protecting himself from opposition party attacks that he is “soft” on the Kremlin. With his legal mind Turnbull knows there is no admissible evidence and no prospect of prosecuting terrorism in the MH17 case. The Australians haven’t realized that their decision that the MH17 is not a terrorist act undermines this month’s proceedings in The Netherlands, where the Ukrainian government has applied to the International Court of Justice (ICJ) to convict Russia of financing, arming and aiding terrorist acts, including the destruction of MH17. The lawyers engaged this week at The Hague haven’t realized either. The 45-page Ukrainian claim against Moscow to the ICJ is dated January 16, 2017, and can be read here. 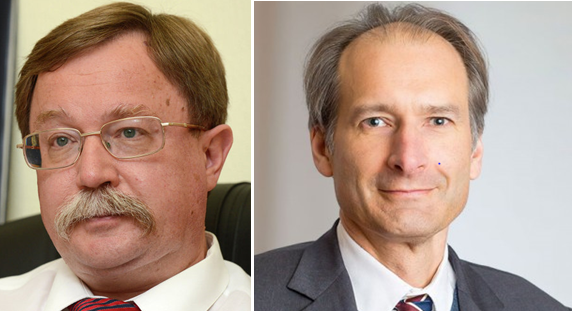 The US law firm Covington & Burling is defending the Kiev government; the advocates for the Russian side include British and French lawyers. The Russian presentations in open court so far can be read here. Ilya Rogachev, Director of the Department of New Challenges and Threats at the Russian Foreign Ministry, testified in front of 16 judges of the court on March 7. Rogachev (below left) was followed for the Russian side by London Queens Counsel, Samuel Wordsworth (right). The JIT, according to Turnbull’s spokesman in Canberra this week, includes Australia, Belgium, Malaysia, the Netherlands and Ukraine. The spokesman said they “remain committed to ensuring those responsible for the downing of MH17 are held to account.” On the other hand, the evidence so far produced by the JIT hasn’t satisfied the admissibility and prosecution tests of the Australian Federal Police (AFP) officers on the JIT staff. 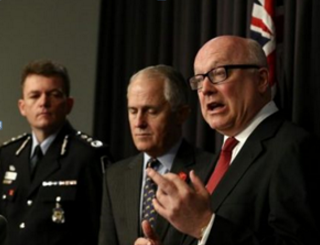 The AFP’s Commissioner Andrew Colvin (right, with Turnbull and Brandis in October 2014) reports to the Australian Justice Minister and he, as well as the AFP, are part of the portfolio of Attorney- General Brandis. In two Australian coroners court hearings, the AFP has revealed serious reservations about the Dutch evidence and Ukrainian claims in the MH17 investigation; for details read this and this. Turnbull adds through his spokesman an additional qualification. “The outcomes of this investigation could be relevant” in determining whether the downing of MH17 was a terrorist act. In Australian law and in the Prime Minister’s judgement, could means not now – and not at the International Court. Wordsworth was repeating in open court what the Australian Attorney-General has already advised the Australian Prime Minister. Because the Australians have decided there is no case for a terrorist act to justify compensating their own citizens, the Ukrainians have already lost their case.